Choosing a hotel can be a bit daunting. Most hotels provide websites with loads of information, beautiful pictures, and perhaps even a virtual tour. However, you never really get the feel of it until you are actually checking in. This is why I usually rely on someone who has already been there. 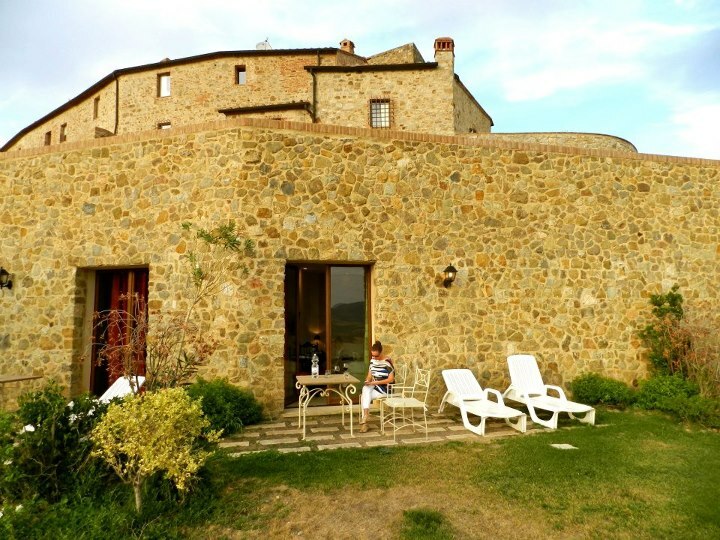 Having stayed at many hotels and being somewhat of a hotel snob I can assure you that the places I've listed in Florence, and the surrounding countryside, are reliable. I have stayed at several hotels that have not made it to the list. It is important that my readers realize this. Our drive to Castello di Velona could have been taken right out of a movie. The genre is yet to be determined. It was a comedy of sorts, with me being thrown about in our little rented Peugeot. Or it was a romance, with me soaking in the Tuscan scenery while holding my husband's hand. It was, on the other hand, also a thriller - I kept threatening to hurt him if he didn't slow down. While I was tossed around the car, my husband turning here and swerving there, little did we know that the winding roads were taking us to the most exquisite Tuscan paradise. It is difficult for me to describe the incredible feeling of arriving at the hotel. When we reached the front entrance and opened our car doors, we heard nothing. Not a peep. Other than an intoxicating, warm breeze and rustling grass, it was complete calm. We stood there, frozen in awe; my motion sickness was quickly forgotten. Seeing the miles upon miles of rolling Tuscan landscape and looking up at the beautiful structure was so very special. The silence broke when my husband noticed the hubcap was missing from our car. Perhaps he shouldn't have taken the road less traveled - a gravel and pothole infested shortcut! Check-in was easy and efficient and before we knew it we were unpacking in our lovely spa room and getting ready for the pool. The views from the pool were so extraordinary that we remained there for the rest of the day. It was difficult to tear ourselves away from the comfortable lounge chairs but our tummies were roaring. Dinner that evening was room service on the patio off our room. A sunset I will never forget. 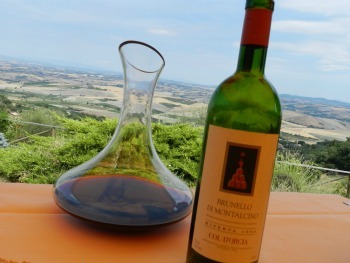 The sweet little town of Montalcino is located only a few minutes away and definitely worth a visit. 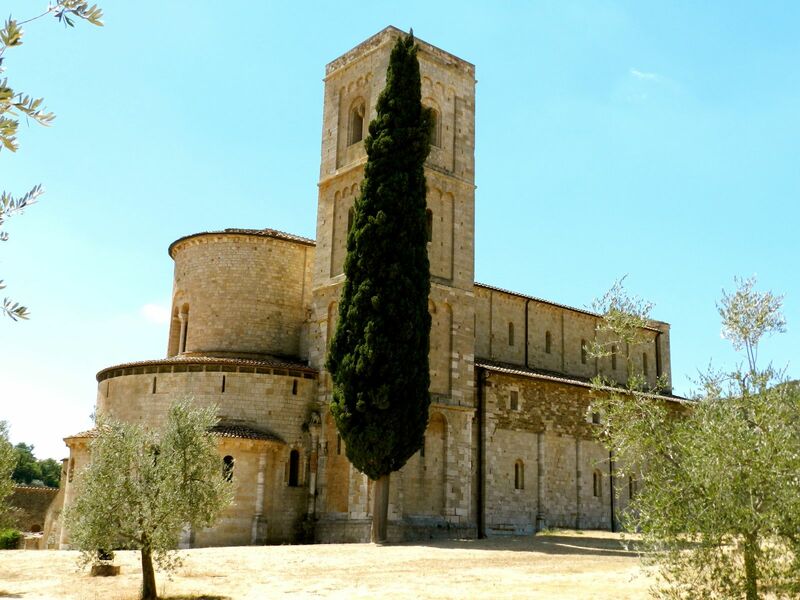 However, the real pleasure was visiting the Abbey of Sant'Antimo, which dates back to the 12th century. It melted our hearts, so we visited twice. We very much enjoyed touring a few wineries, including Poggio Antico. How could you resist an entrance like theirs? 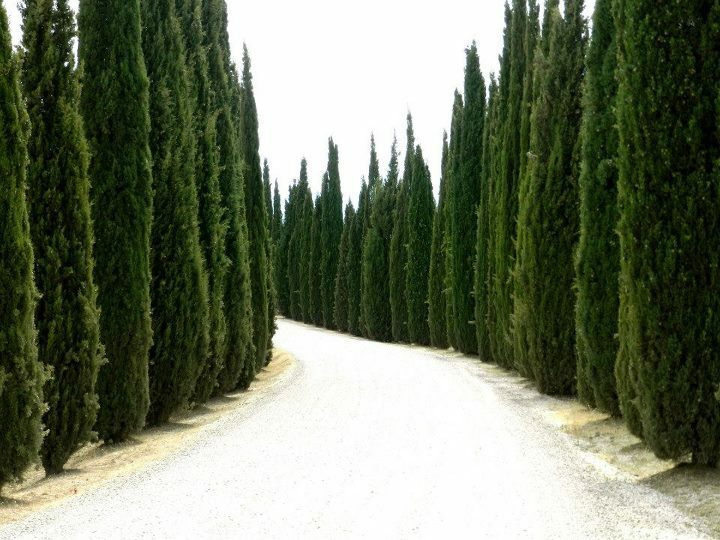 The cypress-lined drive was wonderful. Unfortunately Biondi Santi was closed - but we drove up its inviting drive regardless. Lunch was at Boccon di Vino, a restaurant I will never ever tire of raving about. An excellent meal with a view out of this world; ask for table 22. Actually, all of the tables were perfect. We left this flawless hotel three days later and took some of the most precisious memories with us. 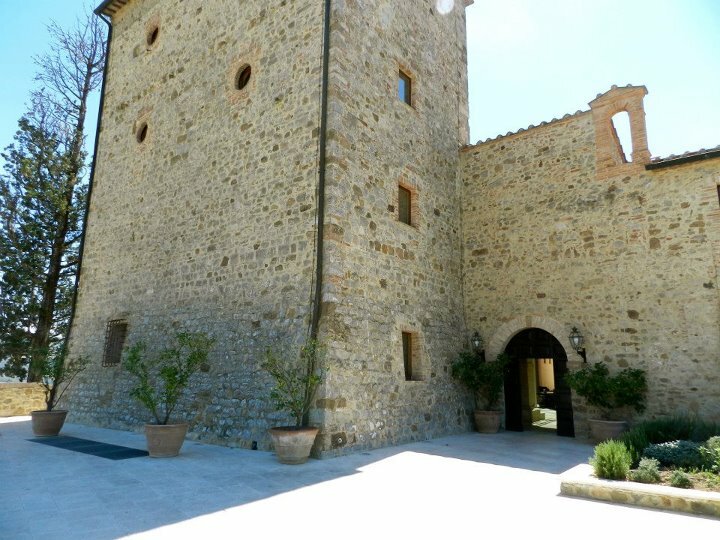 I will forever pine for Castello di Velona. 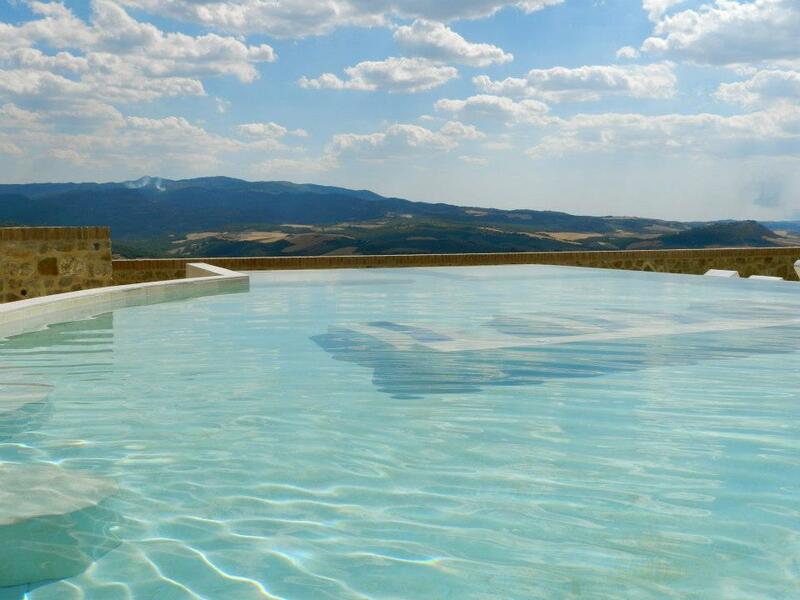 The hotel is located 112 kilometers south of Florence. It was my sister-in-law who introduced me to the Four Seasons in Florence. Grazie mille, Jacqui! How can I possibly convey the absolute perfection of this establishment without sounding a little over-excited? I don't believe I can. I have a very short all-time favourite hotel list, and this one is on it! 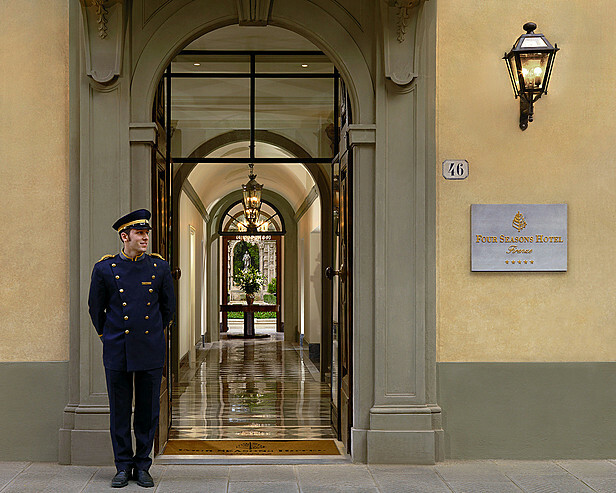 The hotel is situated on eleven acres in the midst of Florence and is surrounded by Renaissance history. 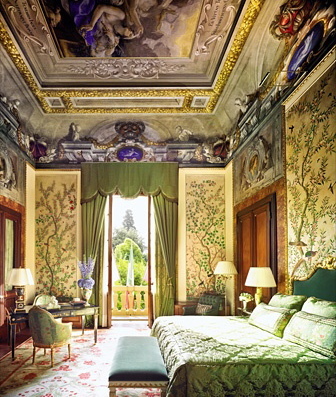 Its 15th century restored Palazzo and Conventino now hold 117 beautiful rooms and stunning suites. The two buildings are spectacular and even the list of previous occupants is impressive: a pope, an order of nuns and five centuries of Florentine nobility. Being that this Four Seasons is a museum more than it is a hotel, you will experience wonderful little surprises, such as the five hundred-year-old door that sits in the corner of the little but luxurious business centre. It is still intact and remains in its original location. 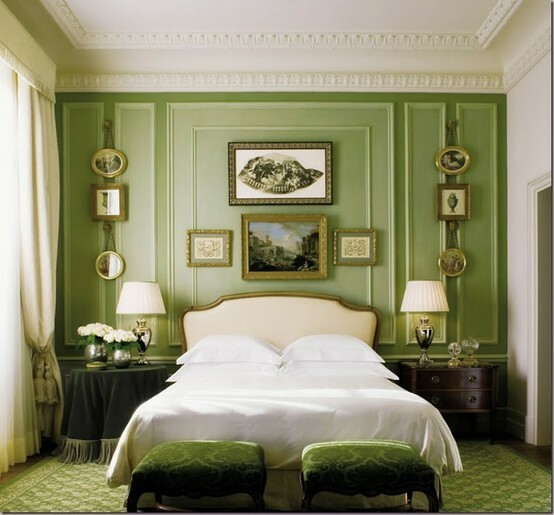 Several of their premium suites boast ceiling frescoes dating back to the 17th century. I was treated to a sneak peek of these suites and was completely blown away. The enormously high vaulted ceilings, silk wallpaper, grand bathrooms, antique furniture and foyers larger than my own room left me speechless and envious of those who get to stay there. My favourite pastime at this hotel, other than eating their perfectly cooked little pancakes for breakfast, is lounging by the pool. The best feature is the grass. 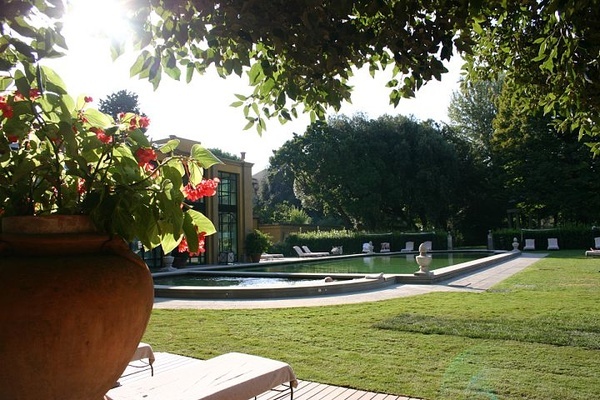 The pool is surrounded by grass and feels as though you are walking on cashmere while making your way over. Lying on their plush towels and consuming the fresh fruit kabobs that are constantly being served make it almost impossible to leave. During our stay I also developed a little crush… on the lawnmower. Not the sweet pool boys, but the motorized lawnmower. Yes, the sweetest little self-controlled lawnmower that does nothing but mows all day long. It wobbles along, turning when it knocks into a tree or hits a path way. At first I thought it was adorable and then I started to feel sorry for it. It works from morning to night. I even named it. I could go on and on; however, I need to finish up. The remarkable history, our beautifully decorated, light-green room, the terrace at breakfast and lounge in the evenings, the sun-soaked and grass-lined pool and friendly staff made everything so incredibly perfect. 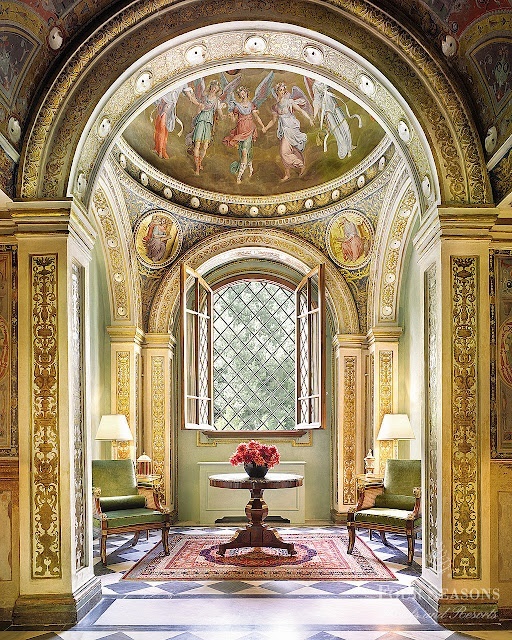 One word for the Four Seasons Hotel Firenze: outstanding! I have yet to recommend a hotel where I have not actually experienced an entire 24 hours. It is extremely important to me that I do not lead readers in the wrong direction. Il Salviatino will be the first exception to this very strict rule. After my thorough tour of many rooms and suites finished off with an incredibly tasty lunch by their excellent Chef Lino, I have every confidence in saying that a stay at Il Salviatino would be a dream come true. 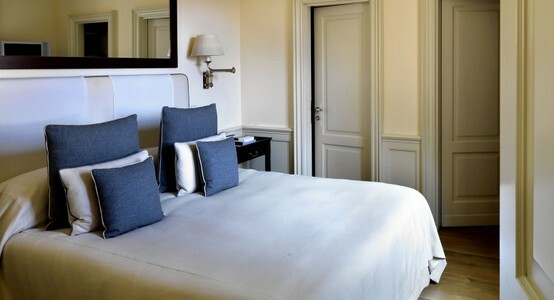 The hotel sits on a hill, offering panoramic views of Florence's historic centre. 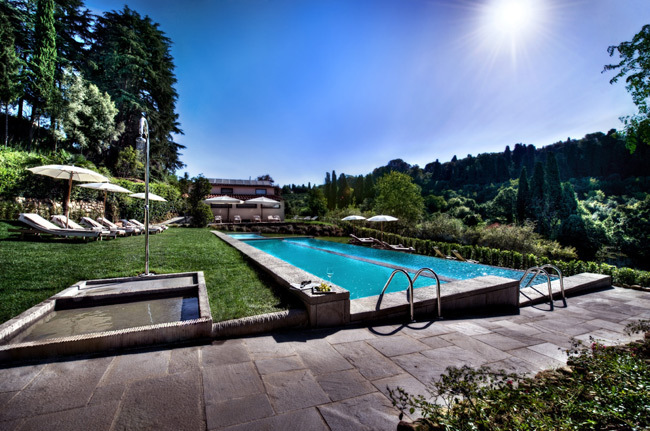 The hotel is located on the outskirts of Florence very close to a town called Fiesole. Do not let that deter you! It is very close to the centre of Florence and their complimentary shuttle will have you there within minutes. One of the hotel's best qualities is the seclusion—no one knows you are there. 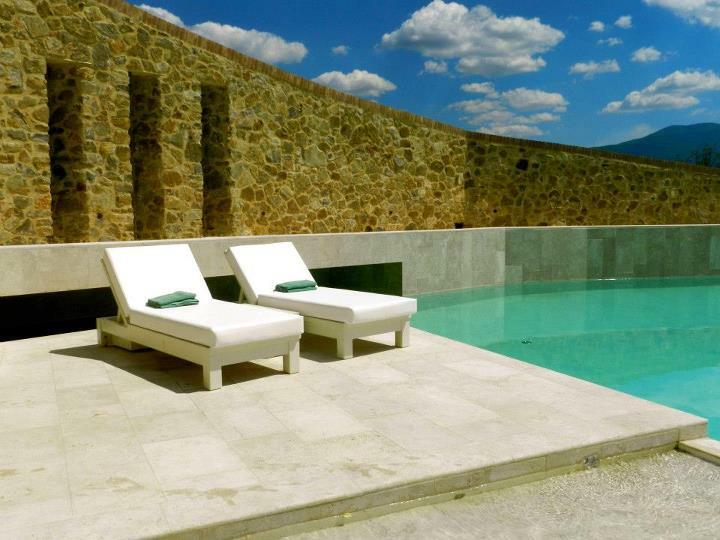 The villa, which dates back to the 15th century, is breathtaking and wonderfully charming. The breeze you feel when walking through the lobby makes the villa feel like it is alive. It is rare to experience that sensation while passing through the corridors of a hotel. The grounds are nothing short of perfection, boasting well-manicured gardens and a perfectly placed pool. These exterior characteristics make this hotel what it is—serene and tranquil. Upon entering the villa I immediately noticed the quarter round. Yes, the quarter round. I realize that is odd; however, when it is made from a very thick rope used for sailing one cannot help but notice. The entire villa is lined with rope. I love it. The rooms are beautifully appointed. 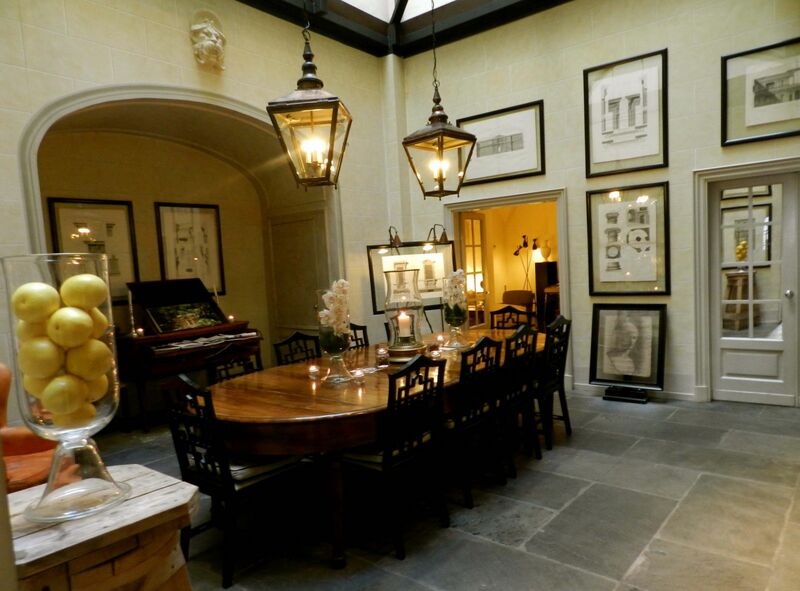 Many feature original architectural elements such as columns, fire places, old brick and stone. Some even have little interesting nooks which leave us wondering what on earth they were used for. My absolute favourite: the teeny tiny bathtubs! I cooed over them for quite some time and had to be pushed along. They date back to the early 1900's and really are the most wonderful things. A hotel is not complete without its dining! 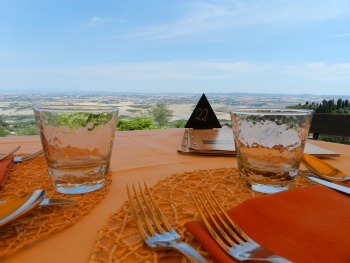 And here you can dine on a most gorgeous terrace overlooking Florence. 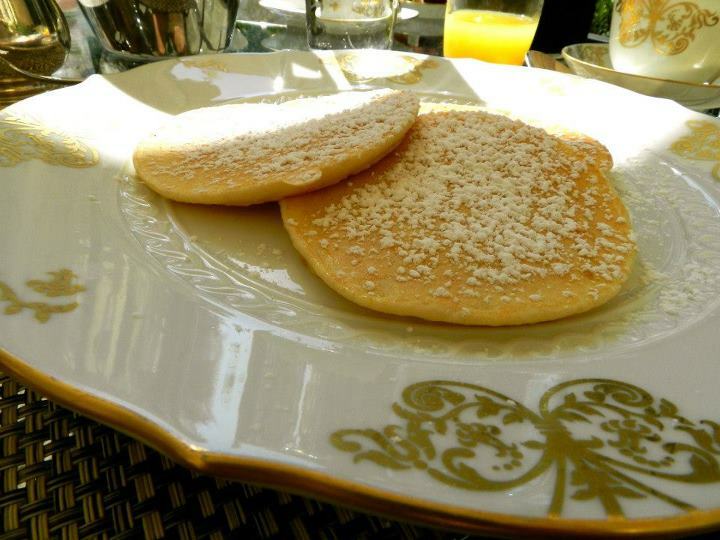 Lino will cook you up something very special, making your meal one that you will always remember. 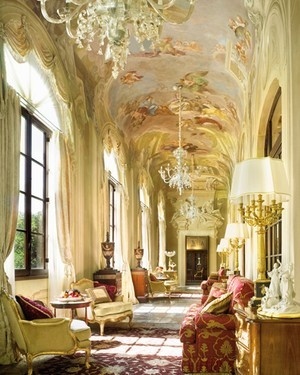 On my next trip to Florence I will be unpacking my bags at Il Salviatino! 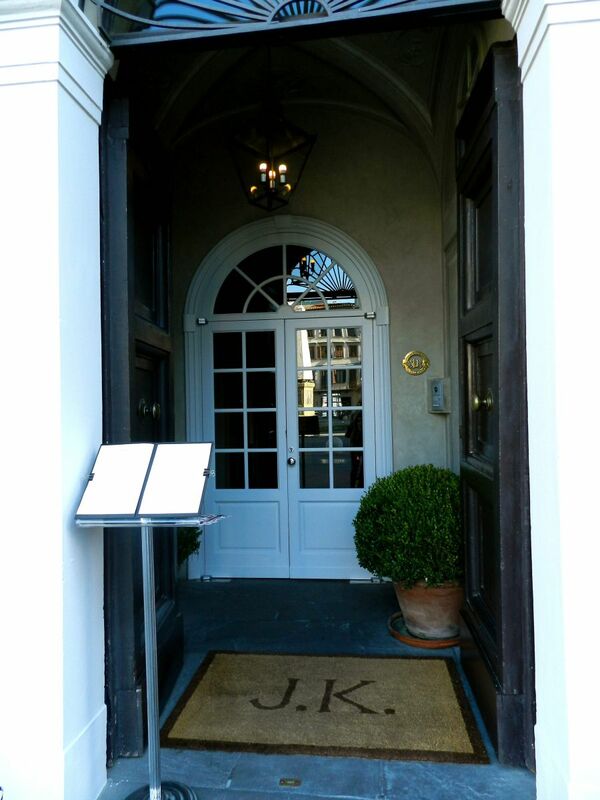 JK Place is a gorgeous and well-appointed boutique hotel located in the heart of the city. I love absolutely everything about it. The hotel sits off of the newly restored Piazza di Santa Maria Novella—an excellent location. 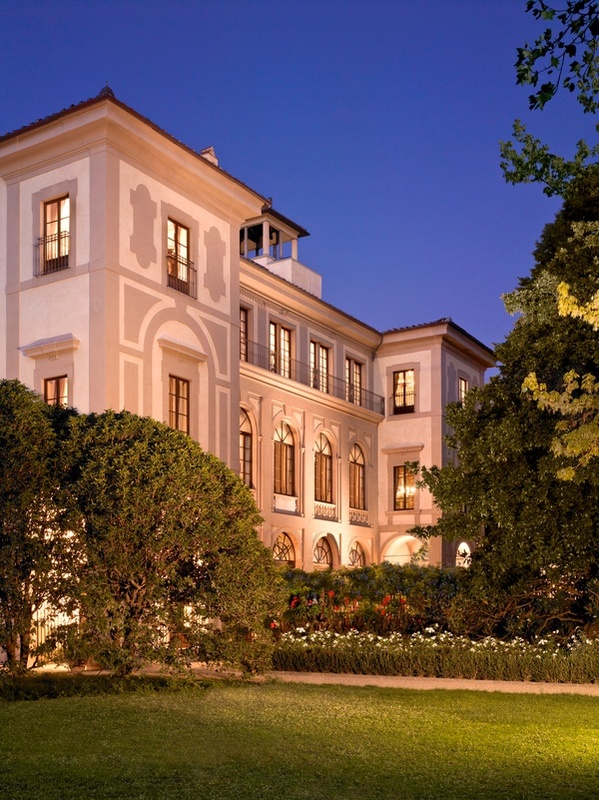 You are walking distance to just about everything you will want to see while in Florence. Viewing the hotel from the street will not wow you. The entrance is charming, yet subtle. But when you step across that threshold you enter into a little oasis. The lounge areas and dining room are striking! I especially love the reception in the library. 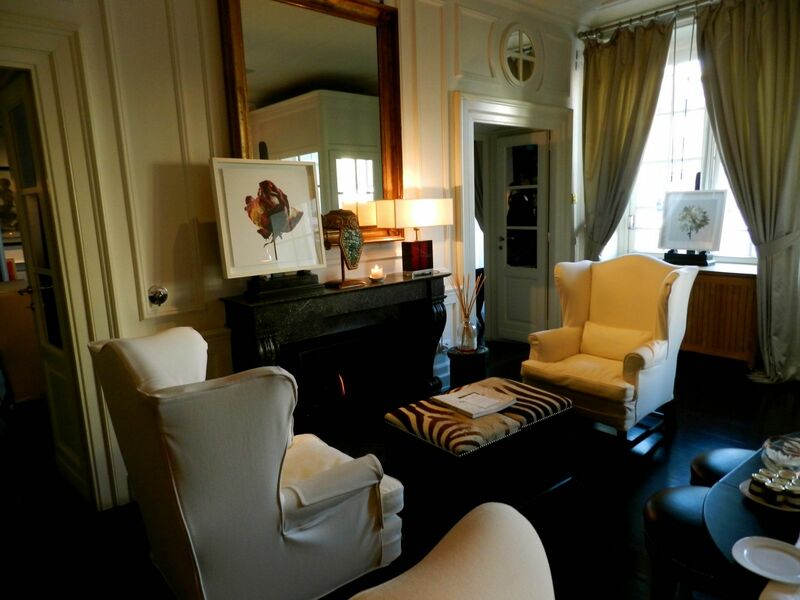 The rooms are luxurious and classic. Every one is unique and the items in your mini bar are free. A wonderful feature! My most precious memory of this hotel is sitting around the fireplace with my mother, sister and niece. It was the last night of our whirlwind trip seeing Paris, Venice and Florence, and we were exhausted. My niece had kept a travel diary throughout the entire trip and asked if we would like to hear it. She read page after page of her wonderful experiences. It was such a beautiful moment and left us all in tears, making her wonder what she had said wrong. 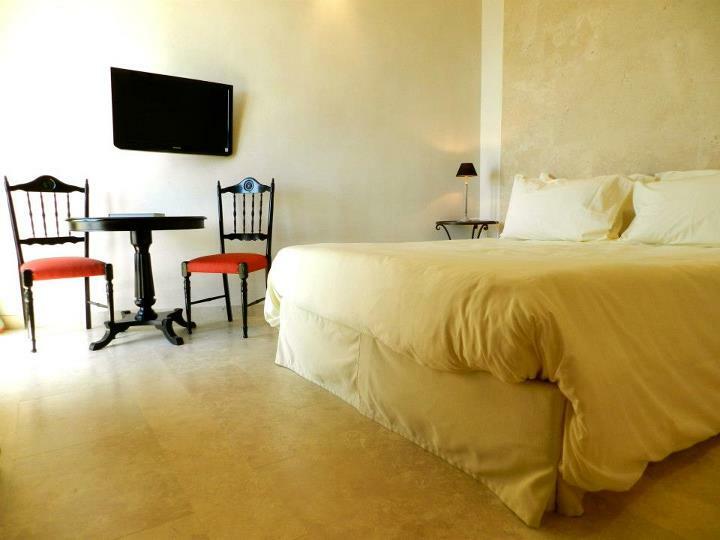 If you are looking for a luxurious stay without the luxurious nightly rate, stay here. Keep your eyes peeled for a deal—they do exist.